Some photos from a trip to Mozambique where we had warm weather conditions with a few cold fronts passing from the South that affected our weather during the first few days. After they passed we had some excellent diving with 15 - 25m vizibility being the norm and water temperatures of 23-24deg. We dived two good reefs coming up from 35 to 15meters which attracted some nice game fish - on our second day out Michael shot a 31kg saily and I managed to get a 20kg couta. The next day I got a nice 14kg wahoo and during our stay we managed to shoot a number of very nice fish such as good size Kaakap of up to 9kg and a number of nice size coutas and other Kingfish. 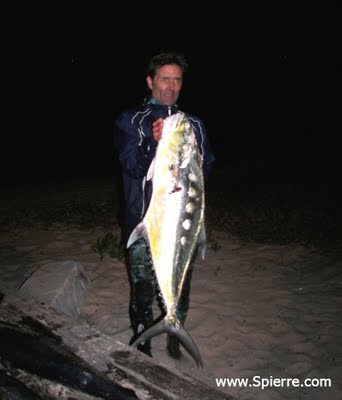 I also shot a nice 12kg Queenfish and on our last day at sea one of the guys got an impressive 43kg Ignoblis Kingfish!. Overall it was a fantastic trip, great to escape the cold winter and dive in some idyllic conditions with whale sharks, manta rays and a warm laid-back lifestyle and excellent hospitality and friendship on land. Can't wait for my next trip! 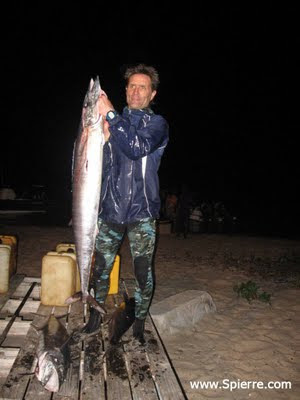 For those wanting to go on an epic Spearfishing trip to Mozambique contact us for more info!